Your Buyer Needs are a big deal in this market. We are in constant communication with agents nationwide, some are feeling the listing shortage more than others. One request we have heard over and over again recently is the need for real estate E-Flyers that are not listing related, but Buyer Needs related. Have you ever thought of using E-Flyers as a way to get your Buyer Needs out there to other agents? As the original real estate industry E-Flyer company, Zip Your Flyer has always tried to help agents and respond to changes in the market to suit your needs. With this widespread request, we have now started offering Buyer Needs E-Flyers. One this to consider when ordering or thinking about an E-Flyer related to a Buyer Need is what makes them different than a listing E-Flyer? For starters there is no actual property, so the design of the flyer needs to catch the attention of other agents right away. Also, keep in mind that the Buyer’s main need is the focus; whether it’s a specific location, or a specific sticking point like acreage… make that your banner. See Buyer Needs E-Flyer samples here. 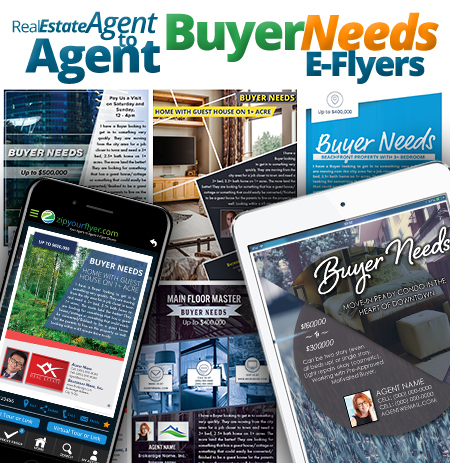 Like all other listing E-Flyers, Buyer Needs E-Flyers still need to be convenient for agents to order so you can be on your way with your busy day. Our real designers still put together these Buyer Needs E-Flyers within a 2 hour window for an agent to receive their proof. A Buyer Need is just as important as a listing, it needs to get out there to agents in the area from our database of over 1 million agents that we constantly update and maintain. p for the industry. Now, you can order your flyers, approve proofs and View your E-Flyers all in an App. It’s a way to see marketing from other agents outside of your email without any cost. The E-Flyer App is Free in the iOS App Store and will be coming soon to the Android platform. This is a great way to gain further exposure for your listing, and now for your Buyer Needs. The Zip Your Flyer E-Flyer app is internationally patent pending and we are very excited to be providing multiple solutions to common concerns agents are voicing regarding an ever-changing market. Please feel free to call us at 888-947-8509 with any questions, or visit www.zipyourflyer.com for more information. As a family business founded by agents, we are truly here to help agents with no monthly commitments. You use us when you need to.